Calling all restaurants! 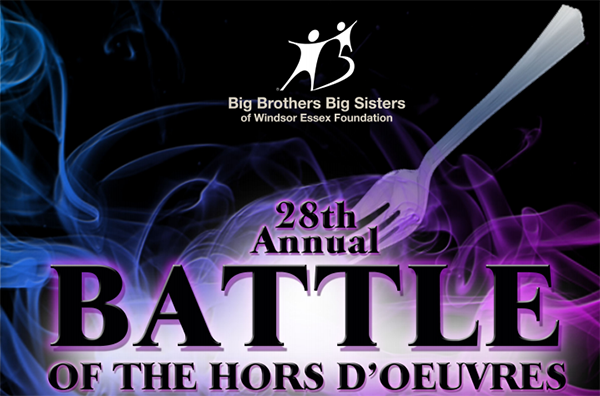 Big Brothers Big Sisters of Windsor Essex is accepting applications for the Battle of the Hors D’Oeuvres. The event takes place May 22, 2014 and will be held by presenting sponsors Caesars Windsor in the Augustus Ballroom. One of our favourite events of the year, Battle of Hors D’oeuvres is always a fun night out in support of a wonderful organization. Restaurants engage in friendly competition and participants get a chance to taste some really creative submissions from local area chefs. WindsorEats will be participating once again this year as a guest judge. Two years ago, the event underwent a very successful transformation. No longer a sit down gala, the Battle has become an after business interactive networking event. An indoor food and drink festival! This event offers an opportunity for guests to schmooze with some of Windsor’s finest food and beverage establishments, while enjoying creative cuisine, drinks, networking, and supporting youth mentoring programs in Windsor and Essex County. Last year over 350 attended and $25,000 raised in support youth mentoring programs in the region. For those restaurants interested, this is your chance to be a part of one of Windsor’s most exciting food competition. If you would like to be a part of the 28th Annual Battle of the Hors D’oeuvres event, please fill out Application and forward to Big Brothers Big Sisters of Windsor Essex Foundation. The event committee will review all applications and will choose based on offering a variety of establishments to the event guests. Further event details will be forwarded after applications are received. Deadline for applications is February 12th, 2014.